The Kinzie Street protected lane. Is this what Milwaukee Avenue will look like in the future? Photo courtesy of CDOT. As Steven Vance wrote recently, protected bicycle lanes will be crucial for boosting Chicago’s bike mode share because they attract the “interested but concerned” set that doesn’t yet feel comfortable riding on city streets. But as the city installs protected lanes on roadways that are already popular bike routes, such as Milwaukee Avenue, it will be important to design and maintain the new lanes so that they appeal to current riders as well. Many “enthused and confident” riders have said they prefer buffered bike lanes to the city’s existing protected lanes due to design and maintenance issues. Others may avoid riding in protected lanes no matter what. So to avoid a backlash from cyclists grumbling that their favorite routes have been ruined, the city should build and maintain protected bike lanes so that the current complaints are addressed. The new street configurations should also allow speedy cyclists to safely ride outside the lanes if they choose, which Chicago Department of Transportation staffers recently said is a legal option. We’ve heard criticisms of the existing protected lanes in person from a number of bike riders. And during a discussion of buffered and protected lanes on The Chainlink, a local online bike forum with over 8,500 members, ten different commenters, the majority, said they prefer the former, for a number of reasons discussed below. At last week’s Mayor’s Bicycle Advisory Council meeting, CDOT staff fielded questions about several of these design and maintenance issues with responses that suggest these issues are on their radar and they plan to take action on them. Here are some of the complaints about the existing lanes, along with some possible solutions. The following photos were taken yesterday during a ride downtown on the Elston Avenue, Kinzie Street and Dearborn Street protected lanes. Car parked in Elston Avenue protected bike lane south of Division Street. Photo by John Greenfield. Solution: Build wider lanes. CDOT Project Manager Mike Amsden recently told Streetsblog that the five-foot minimum width for protected lanes won’t be sufficient on Milwaukee, so the agency wants to build wider lanes with plenty of room for passing. A Streets and Sanitation truck parked in the Dearborn protected lanes near Lake Street. Photo by John Greenfield. Complaint: There’s an increased danger of cyclists being struck by turning vehicles due to poor sightlines. “Conflicts with turning cars are made worse by the row of parked cars blocking cyclists’ and drivers’ views of each other,” said Chainlink commenter Cameron Puetz. Solution: Dedicated bike traffic signals. These are standard on protected bike lanes in Europe, and CDOT successfully piloted them on Dearborn last year. Although fast cyclists may complain that the bike stoplights slow them down and may disregard them, they’ll make conditions much safer for those who obey them. A pedestrian in the Dearborn protected lanes at Jackson Boulevard. Photo by John Greenfield. Complaint: Pedestrians walk in protected lanes and stand in them while waiting to cross the street. Solution: Warning signs and markings; outreach to peds via the Bicycling Ambassadors and advertising. Last week Amsden said CDOT will be repainting “Look” stencils on the street, adding green pavement at intersections, and the ambassadors will be doing more outreach. Complaint: Curbside pavement slopes toward the gutter and tends to be poor quality. Solution: Build wider lanes so cyclists can ride further from the curb; better pavement maintenance. At the MBAC meeting Amsden said CDOT will no longer be installing bike lanes on poor quality asphalt and lanes will be striped as part of repaving projects whenever possible. Klein said divots along the Dearborn lanes that currently fill up with water and ice will be patched in the near future. A slush-filled divot in the Dearborn protected lanes near Adams Street. Complaint: Protected lanes are more likely to accumulate gravel, glass, garbage and snow. Solution: Regular street sweeping and snow plowing. Last week Klein said CDOT has taken over plowing duties from Streets and Sanitation, and outreach to building manager could prevent snow from being shoveled from sidewalks into the lanes. I’m so glad CDOT is going to address some of these problems! 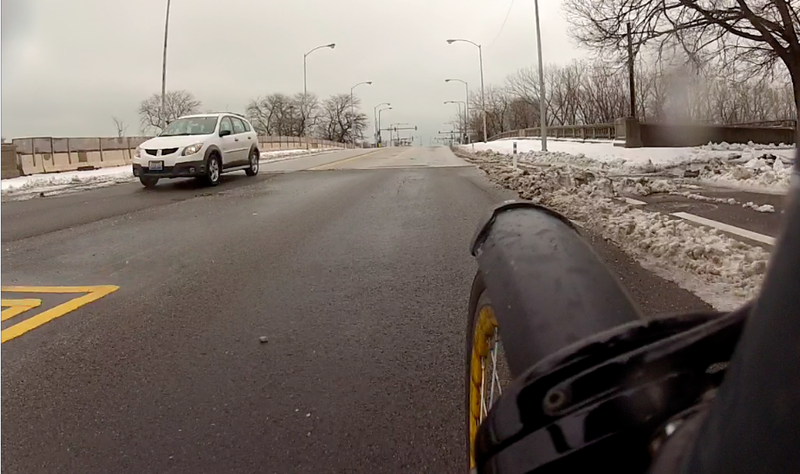 Can you ask someone from IDOT when they will install signage to match the paint on the road on Marshall Boulevard? Fixing the giant holes under the Metra bridge by 21st would be great too. Thanks! These new improvements are important, but there are many existing bike lanes that need to be REPAINTED. In particular the bike lanes along Lawrence, west from the Chicago River invisible in many place where the cover both the 39th Ward and the 45th ward all the way west to Milwaukee Avenue. Creating new won’t do much except get kudos, and then left to evaporate by neglect. Maintenance is a huge issue, since right now there’s no dedicated funding for it. Protected lanes involve a lot more striping than conventional ones, although cars are less likely to drive over them. It will be interesting to see how PBLs are maintained in the future. Sure, I’ll look into this. Bike signals are good, but don’t really address the turning vehicle concern outside of the Loop where most intersections are not signalized. Good point. European-style raised bike lanes, like the kind they have in Copenhagen (and Indianapolis!) could help with this problem as well. We’ll explore this topic in a future post. I’ve noticed the “LOOK” paint on the pavement on the Dearborn lane is already worn out. It was worn out in mid-February. A U.S. traffic engineer for a large city will typically give traffic signal priority to the motor vehicles–which are mainly cars–along a corridor. This also speeds up the buses. The bicyclist will often prefer to ride on these streets because of not having to stop as frequently, even though it is much less comfortable to ride on due to the traffic. In contrast, the Netherlands will give priority to the bicycle, because they do not have enough space for more cars in their cities. The Netherlands will also try to separate the vehicles that have greater mass and speed from other vehicles. A good example of how this typically works with U.S. traffic engineers is the Orange Line BRT, which runs across the San Fernando Valley in Los Angeles and parallel to it is a mixed used path for pedestrians and bicyclists. There was enough room and money to recreate a bike path that is standard in the Netherlands. The buses are on a dedicated busway that is physically isolated from parallel streets and there is separate signaliation with each bus having transponders that can trigger a green light as the bus approaches the intersection. The LADOT made sure that the bus stops at some intersections regardless if there are motor vehicles waiting on the cross street. Yet, the city just announced that they have synchronized all of the traffic signals on the streets, which can be adjusted to keep the traffic flowing (sped up). To the traffic engineer, its one box (bus) versus 10 boxes (cars) that have to go through a intersection. The traffic engineer cannot see that there is only one person in each car and the bus could have 80 or more people in it. The mixed use path for bicycles alongside the Orange Line BRT is given even less priority than the buses. I counted 20 traffic signals and two stop signs in a approximate 10 mile length of this path, and at each one of these the bicyclist is required to stop. The green light is triggered by either hitting a pedestrian push-button or a bus going through the intersection. Compare that to a 14-minute ride that the author of the blog BicycleDutch made to the dentist where he only had to stop three times along the route. The pedestrian push-button on the Orange Line mixed use path is also beyond arms length from the ramp to the street. A cyclists will have to make a large half-circle manuever to reach the ramp after hitting the pedestrian button. To the traffic engineer, this is done as a safety improvement, making sure that the cyclist does not roll out into the street and they must stop at each intersection. For a choice of transportation that is the fastest and most convenient way to get somewhere, this traffic engineering has made the clear choice the automobile, rather than a bicycle or a bus. If you have streets that are congested with too many cars, then it would seem you would want to give priority to transit, pedestrians and bicycles, which have a higher capacity for a given amount of space. Instead, it typically works the opposite way in large U.S. cities; if the street is congested with cars, then make sure the cars are given every square inch of space and prioritized. THey’re due to be rejiggered when the new Lawrence streetscape goes in this spring, so I can see how they might not repaint them if they’re just going to be paved over in a few months. Makes sense. Let’s hope that streetscape moves forward. I first wrote about it years ago! It would be great to see the lanes on Lawrence repainted as soon as this spring. Strongly agree! In addition, every time a street is opened up and closed again, repaint what was there. Whole stretches of Elston, Milwaukee, Halsted and Damen only show ghost images of what is supposed to be the bike lane or shared road sign. A particular reason I’ve seen many pedestrians in the bike lanes over the winter and why I’ve actually done it myself when walking is due to lack of clearing snow from sidewalks by residents or businesses that didnt think it was important to do so or anywhere there are sidewalks along vacant property. 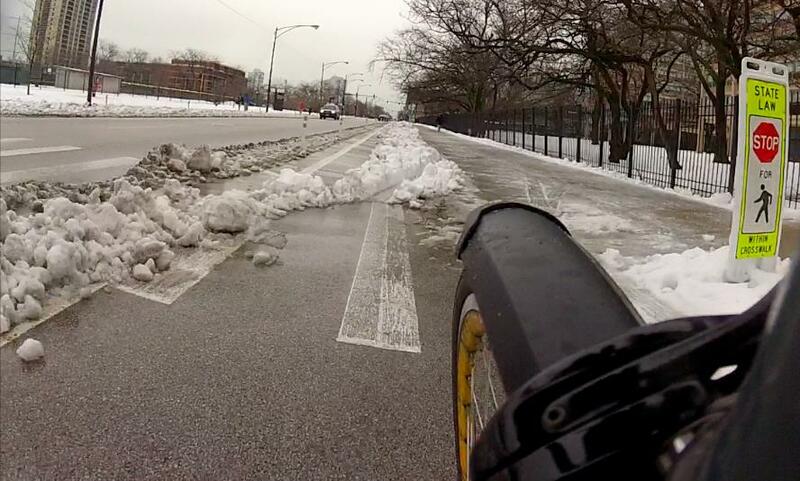 Additionally many parts of the 31st bike lanes weren’t sufficiently cleared of snow themselves this winter causing any cyclist to move to the vehicle lanes thus making the situation more dangerous than if there were no bike lanes to begin with.